The human cytosolic Glutathione S-Transferases (GSTs) are expressed as 18 distinct gene products yet they share a common structural morphology. 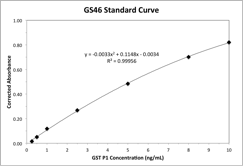 This immunoassay is specific for GST Pi (GSTP) and exhibits less than 1% cross reactivity towards the other 17 human cytosolic GST enzymes. GSTP is considered to be a urinary biomarker for renal cell damage and is localized to the distal convoluted tubules, thin Loop of Henle, and the collecting ducts of the kidney. This is a standard sandwich enzyme linked immunosorbent assay (ELISA). The plate is pre-coated with anti-GSTP and blocked, ready for the addition of samples and standards. The assay should take about three hours to run, plus any required sample preparation time. When measuring urine samples, it is recommended to normalize samples to creatinine to account for variations in fluid intake and excretion. Creatinine is produced at a constant rate and can be used to normalize the concentrations of other analytes. Creatinine Assay Kit (CR01).